James Gurley was ahead of the curve, a trend setter, Zombie Cool before the rest of us knew! Local author and Zombie King James Gurley shares his zombie knowledge in his novels Ice Station Zombie, Judgement Day, Judgement Day: Redemption and Judgement Day: Retribution. The current IT monsters of the day have never been as interesting as those in Gurley’s novels. Gurley dabbled with writing until his 40s when he had a collection of short stories privately published as a Christmas gift for his family. They encouraged James to continue writing. This private collection grew into his first published novel, a science fiction piece titled God Seed. Fifteen novels followed. Hell Rig from Damnation Press was the fist to have commercial success. Hell Rig is about a haunted oil rig with battles between Voodoo Loas or gods. This is where zombies came to life for Gurley with dismembered Zombies prowling the rig. They eventually land in Antarctica and Australia. A publisher from Severed Press in Tasmania contacted Gurley with interest in a zombie series. Thusly, Ice Station was born. A series in Arizona featuring more weapons followed. Gurley is working on his seventh zombie novel and fourth series, each featuring a unique cause for outbreak. 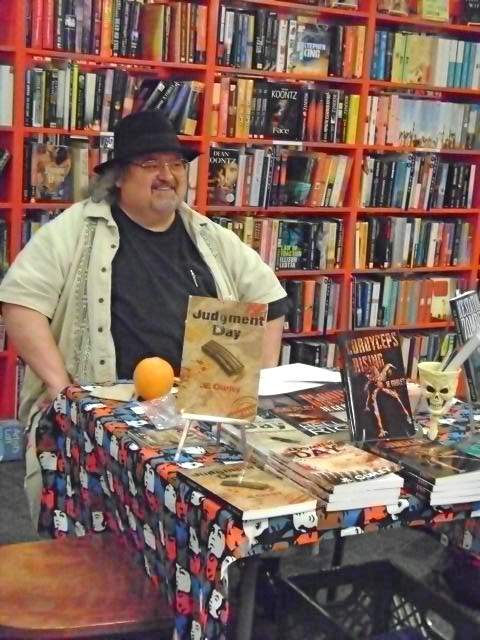 Meet James Gurley in person from 1 to 3 p.m. on Saturday, May 10 at the next Bookmans Speedway Author Fair, Novel Geekout.